Voting is now open for the Party Sauce awards 2018! Giving out awards for music is kind of silly. Everyone knows this. There’s nothing stopping any random person from just giving out a bunch of “awards” to themselves and their friends. Everyone knows this too. So here we go with the Fourth Annual Party Sauce Awards. AKA the Lollies! We’ll be having a big party at Taco Pica to announce the winners on Saturday, March 17. Pleased to announce THE WINNERS of the 2017 Party Sauce Awards! – Dopest and most LEGITIMATE music awards award: Party Sauce Awards 2017! Thanks and congratulations to everyone involved! So here we go with the Third Annual Party Sauce Awards. AKA the Lollies! You can vote on your favourite New Brunswick electronic musicians and so on. Here’s the form. Make a difference in the world! Vote! 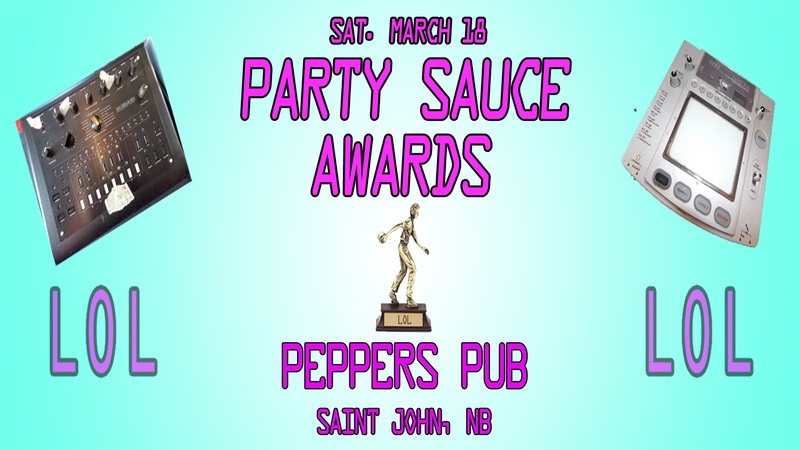 The awards gala takes place at Peppers Pub in Saint John on Saturday, March 18. It will feature live performances by Shrimp Ring, DenMother and DJ Jack Buster and is sure to be a wild time.